If you’ve driven by the new southeast tower at J.W. Ruby Memorial Hospital recently, you may have noticed a new sign on the tower: WVU Heart and Vascular Institute. The sign – located above the tower’s new entrance – is an indication that construction of the new $200 million, 10-story tower is progressing ahead of schedule, according to WVU Medicine-WVU Hospitals Chief Operating Officer Ron Pellegrino, MD. Floors 1, 3, 5, 6, 7, 9 and 10 will open in January and February. Tours of the new tower will be available for staff in early January. A grand opening event will occur on Thursday, Jan. 19. The new tower is allowing the hospital to increase the number of patient beds from 531 to 645. “Our census continues to increase,” said Pellegrino. “Through November, for example, our average midnight census was 462. In 2015, during the same time period, our average midnight census was 414; in 2014, 401. The new tower is home to the WVU Heart and Vascular Institute, which will lead WVU Medicine’s statewide efforts in cardiovascular patient care, program development, research, clinical education, and outreach. 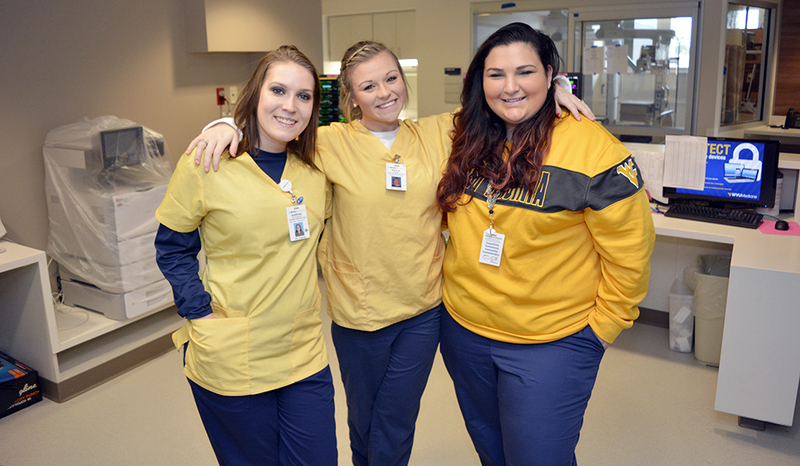 Cardiac monitor technicians, from left to right, Sabrina Cartwright, Kayla Sisler and Megan Maxwell pose in a nurses station on the third floor of the new southeast tower. The third floor will house the Critical Care Unit/Cardiothoracic Unit.